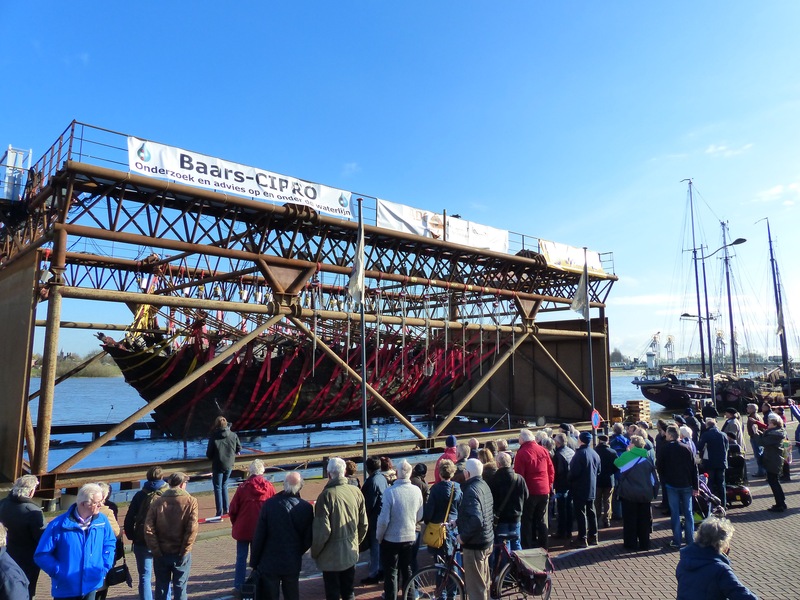 An early 15th century merchant ship was raised from the river IJssel near the Dutch city of Kampen, about 60 miles northeast of Amsterdam, on Wednesday. The wooden ship is 20 meters (66 feet) long, weighs 50 tons and is a type of vessel known as a cog, a single mast flat-bottom ship that was the workhorse of the Hanseatic League’s Baltic maritime trade. It is the best preserved medieval cargo ship ever discovered in the Netherlands. The cog was discovered buried in the sand and silt during dredging operations in the summer of 2011. Two smaller vessels, a barge and a punt, found at the same time were recovered last October, but the cog is the largest, the heaviest, the most intact and the most historically significant, so raising it required a months of advanced planning. 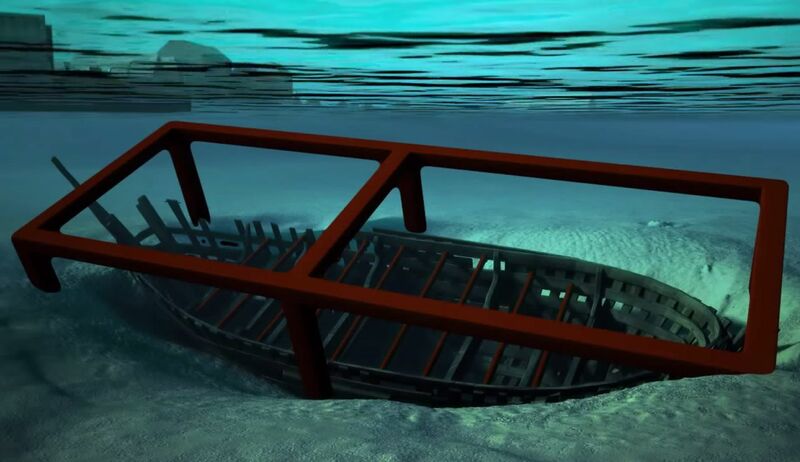 Divers ran straps underneath the hull of the ship and attached them to a steel cage structure that would keep the entire vessel in one piece. Sensors inside the ship reported on the pressure inflicted on various parts of the ship while forty motors lifted the cage and the 50 tons of oak ship within. The raising was expected to take all day, but the cog was in even better structural condition than experts realized, so they were able to lift it out of the water in a few hours. Crowds on the shore cheered when it emerged from the river for the first time in 600 years. When the cog was first discovered, archaeologists thought it was deliberately sunk as a means of waterway management. On the night of November 18th-19th, 1421, a tidal surge from the North Sea broke through the dikes of a large part of what is now the Netherlands. The 1421 St. Elizabeth’s flood (November 19th is St. Elizabeth of Hungary day) claimed thousands of lives and redrew the map of Zeeland and Holland. The Rhine river, which before the flood had flowed into the IJssel, changed course and flowed over the Waal to the North Sea. The IJssel’s water level dropped, severely hampering its commercial value. The heavy cog and smaller ships could have been dropped onto the riverbed in an attempt to narrow the width of the fairway and raise the water level to make the channel suitable for cargo shipping again. 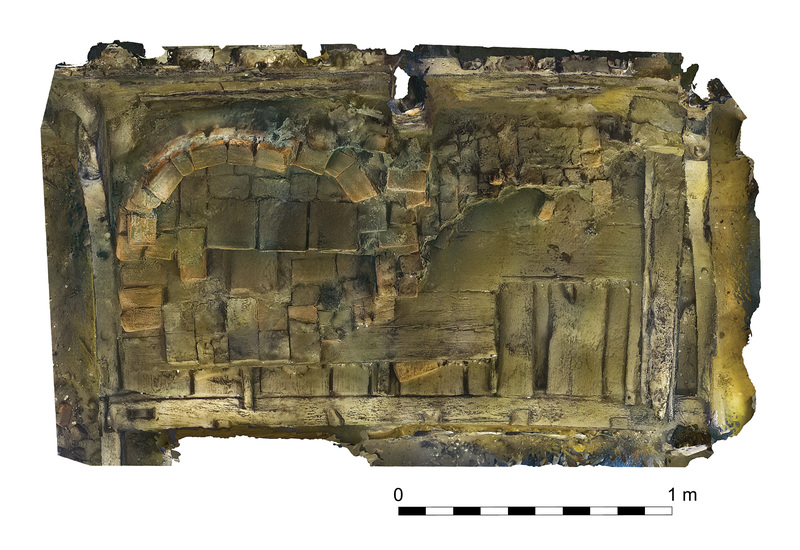 Going by that theory, archaeologists didn’t expect there to be anything inside the vessel, assuming anything of value would have been stripped before the sinking, but much to their surprise divers discovered the ship’s galley with brick dome oven and glazed tiles.This is the first full galley ever discovered on a medieval ship. They also found a water pump, a willow twig fish trap and two pilgrim badges. They’re not the kind of thing that would be discarded without a thought, so it may be that the cog went down by accident rather than on purpose. Once it was raised, the ship was moved onto a pontoon where it will stay until Tuesday while a special frame is built to transport the cog, barge and punt to Lelystad where the State Service for Cultural Heritage (RCE) has a custom-built conservation station where the ships will be kept wet and gradually dried over at least three years to ensure the wood is preserved without shrinking, warping or cracking. Conservators will also attempt to reattach parts of the cog that were recovered separately. 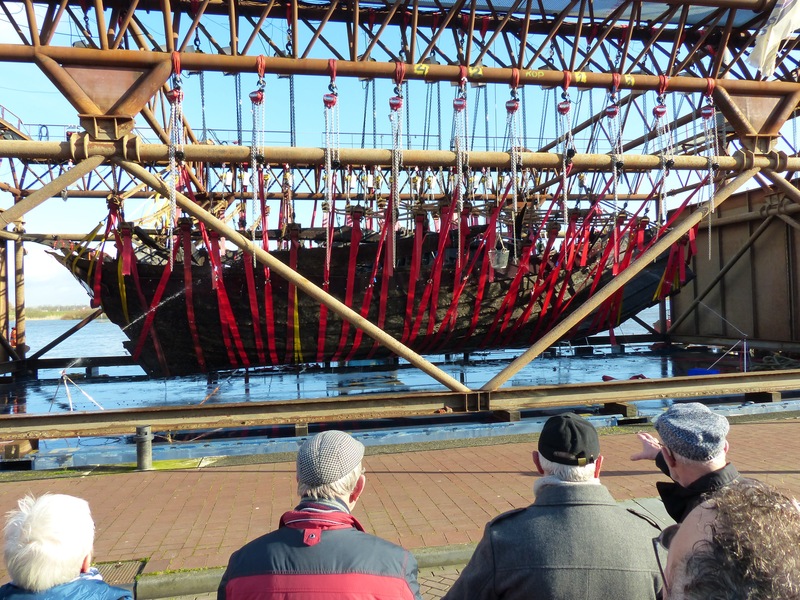 The public will be able to view the ship during conservation in Lelystad. 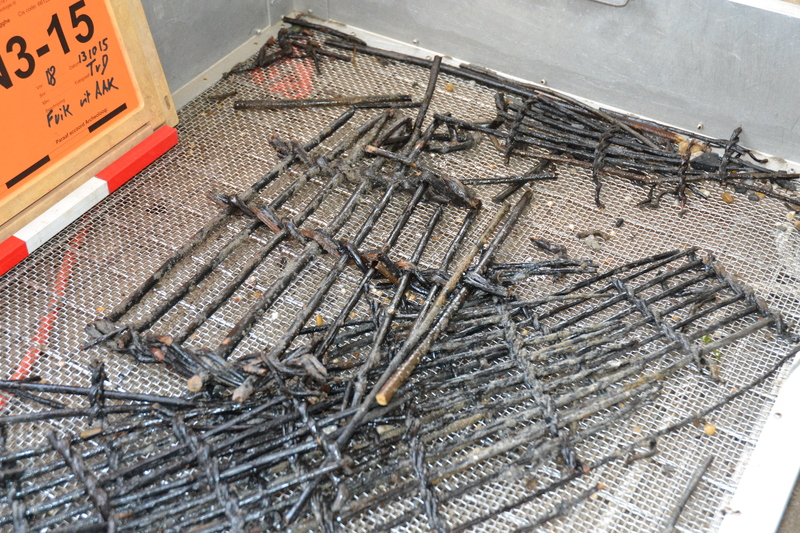 After it is conserved and in stable condition, the vessel will need a permanent home. The city of Kampen is keen to have it back. 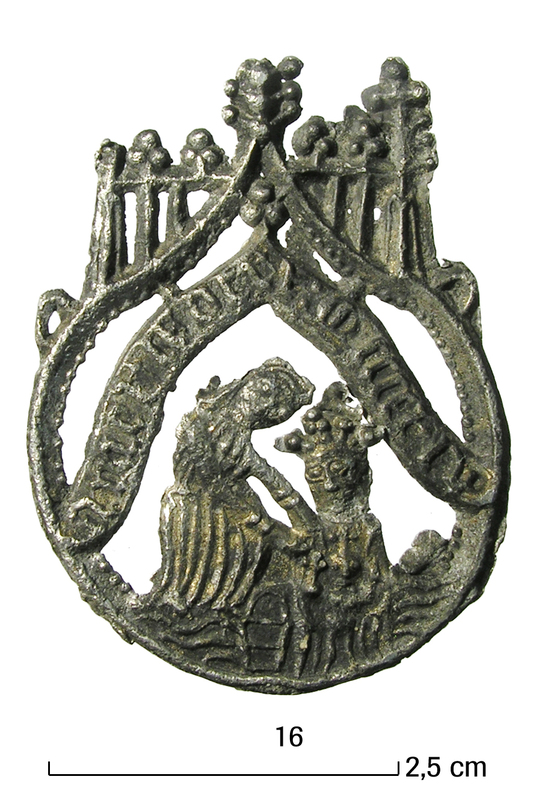 It already has a replica of a 14th century cog, but this is the real thing, an icon of Kampen’s independent trade and Hanseatic League history. Kampen’s location between the Zuiderzee bay and the Rhine made it a bustling center of trade starting in the 13th century. At its peak in the 14th and early 15th centuries, Kampen was a major city eclipsing even Amsterdam. 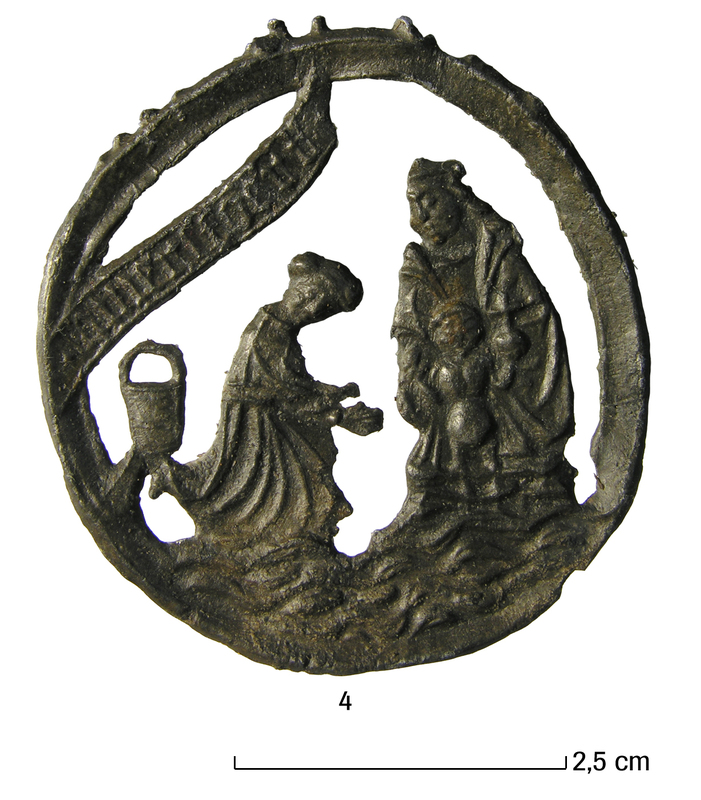 With the St. Elizabeth flood and silting of the IJssel, the city’s fortunes began to decline. The cog, therefore, is an example of Kampen’s great prosperity in its many years of service as a merchant cargo ship as well as being an example of Kampen’s loss of prosperity in the means of its demise. This entry was posted on Friday, February 12th, 2016 at 11:10 PM	and is filed under Medieval. You can follow any responses to this entry through the RSS 2.0 feed. You can skip to the end and leave a response. Pinging is currently not allowed. Small correction: it ‘s Lelystad, not Leyland… also, while gladly acknowlediging he’s a personal friend of mine, I think a tribute to chief investigator Wouter Waldus is in order here, lots of capable people were involved but I do believe he really pulled the whole thing off – and up. Nice article ny the way, I suppose I should have started with that. Thank you kindly for the correction and for the very well-deserved tribute to Wouter Waldus. From what I could divine from the horrible online translator versions of Dutch articles, he was a real driving force behind the study and raising of the cog. What cool friends you have! I found this fascinating, another view into medieval life in Europe. I am especially interested in the oven: was it part of the ship,or part of the cargo. If so, why was it assembled? If part of the ship, what was its purpose? I know so little of this sort of thing, I don’t even know the questions to ask! I am wondering if perhaps someone, even a family, perhaps lived aboard, as they did (and do) in so many places with canals and rivers. Very intriguing, and I am looking forward to learning more of what this boat has to teach. It was part of the ship. These were sea-going vessels capable of transporting goods over the Baltic so some means of cooking food was necessary for longer voyages. It was a pretty big oven too, at two meters (6.5 feet) wide. The biggest cogs were about 25 meters (82 feet) long, so this particular vessel was on the larger side of the spectrum. I too am very curious to learn more about the cog and its kitchen. Some of the Dutch articles referred to it as a “pizza oven,” but that’s just because it’s a domed brickwork oven and there are domed brickwork ovens in pizzerias. I would love to know what kind of food they made on board. Thank you for the post; I really enjoy these articles!